The Transactions page is where you can see all of your transactions in one place. All of your transactions are presented on the Transactions page in a table with 8 columns. The transactions page is also where you can edit, delete, split and categorize your transactions. The Transactions page is like a search engine for your transactions. We go into more detail about using the search panel on the Transactions page here: Searching your transactions. But you can also use the sidebar on the left of the Transactions page to quickly view transactions based on different criteria. 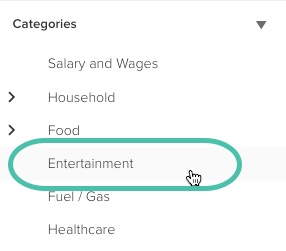 If you want to see transactions in more than one category, check out our user guide: Using the search panel to learn how to create a search based on more than one category. 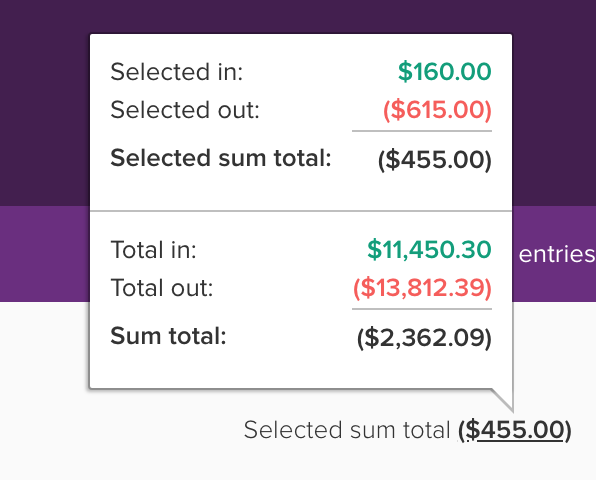 Save yourself a trip to the calculator by using the sum total feature on the Transactions page. Located in the top right of the Transactions page, PocketSmith will display the sum total of the transactions listed. If you selected some of the transactions, the total displayed will be based on those transactions. Click on the value to see the sum total, as well as the total in, and total out. Click on the value to see the sum, total in, and total out of the selected transactions. If you have multi-currency enabled, the Transactions total will display differently depending on whether you have chosen to 'show balances in base currency instead of native' or not. 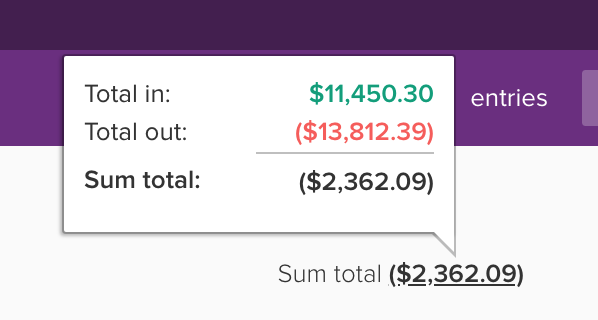 If you have chosen to display your multi-currency account balances in their native currencies, you'll see the totals for each currency displayed separately. If you've chosen to 'show balances in base currency instead of native', your transactions will be converted to your base currency using the current exchange rate. If 'Show transactions in base currency' is enabled but PocketSmith isn't able to get an exchange rate for a transaction that is included the total, it will safely fall back to show in separate currencies. Choose from a line graph or pie chart view to analyze your transactions. The line graph shows the balances of your accounts over a period of time, based on the accounts in the current search criteria. Above your list of transactions, there is a toolbar with additional options. Some options will only appear here once transactions have been selected.